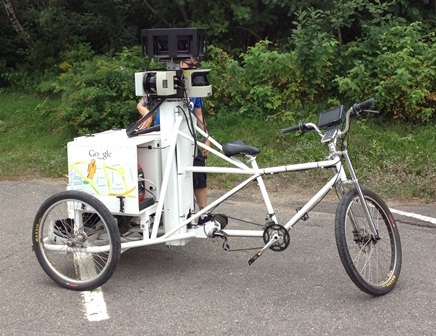 This past August and September, Google's Street View Crew visited UNB Fredericton and Saint John with a tricycle and a SUV equipped with 360-degree cameras. Creating a street view of a city, or a university campus and putting it in a geographical database allows people to tour the city or the campus without actually being there; it’s a virtual tour. When Google pioneered its Street View technology in the United States in 2007, it seemed quite remarkable. But how original was the concept? No very, it seems. The basic idea behind Street View was investigated back in 2000 in the Department of Geodesy and Geomatics Engineering at UNB by a research team led by Prof. Y.C. Lee. The research results were presented by then graduate student Stephen Rawlinson at the annual conference of the AmericanSociety for Photogrammetry and Remote Sensing in St. Louis, Missouri, in April 2001. The results were subsequently published in the conference proceedings and then in Mr. Rawlinson’s master's thesis. Wondering how street view works? Well if you take a look at the poster that was produced by Dr. Lee in 2001 for GGE's 40th anniversary celebrations, it concisely shows the principles involved. The background technologies were (and still are) taught in GGE’s mapping and geographical information systems courses. Google has been very successful with its technology, one that is very similar to that developed earlier at UNB. Currently, there are 20 petabytes of data for Street View, consisting of photos taken along five million miles of roads, covering 39 countries and about 3,000 cities. Did Google get the idea for Street View from UNB? We'll probably never know.